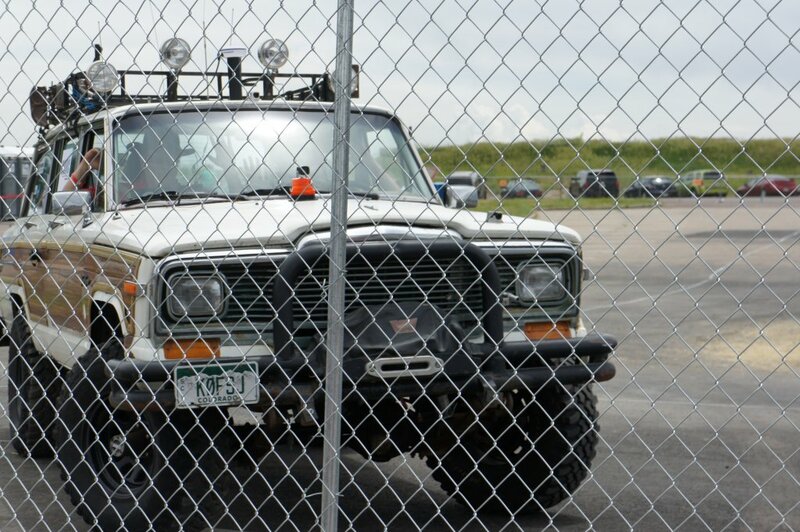 The last thing we needed was a 5,000 lb full size Jeep going out of control at the 2014 Sparkfun AVC. One of our safety features was an on-by-default brake actuator. 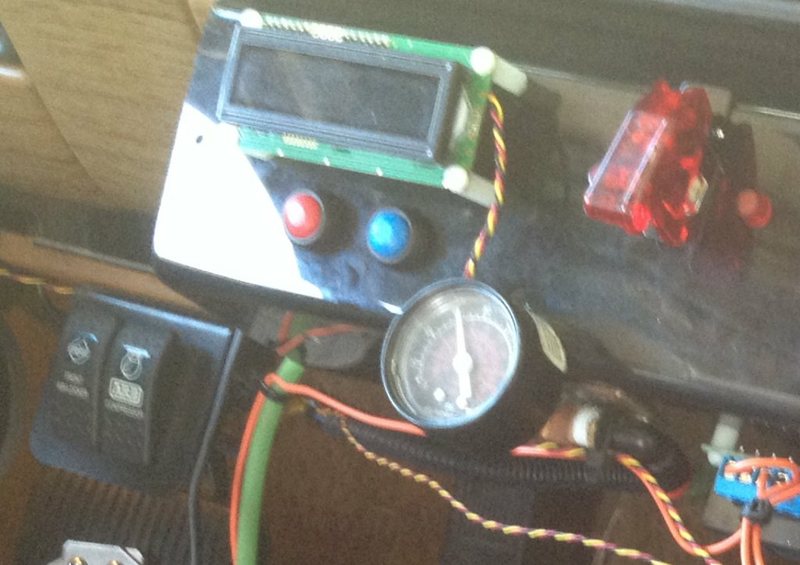 The microcontroller deactivates it during a run but if hitting the e-stop, or shutting off the ignition, or arriving at the last waypoint re-activates the actuator and stops the Jeep. During the run I could still press the brake manually. Here's how we built it. The actuator uses a large pneumatic cylinder. Convenient, because the Jeep already had an on board air compressor with regulator and all the trimmings to run the ARB front locker and air up tires. After the A/C went out, I converted the compressor for off-road duty, mounting it vertically, and installing a crude manifold. 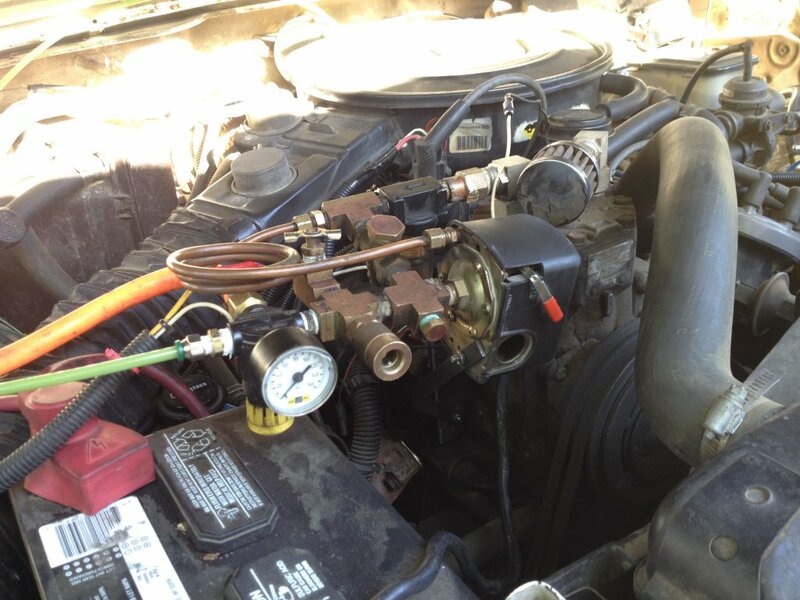 The manifold contains a pressure switch with relief valve, a gauge, regulator, and oil separator. The system also has a reserve tank. The pressure switch turns the compressor on and off to maintain air pressure in the tank and the relief valve bleeds the air pressure off the compressor after it turns off. We plumbed in 1/4" flexible hose (green, above left) that runs into the cabin. There it goes through another pressure gauge mounted to the main console on the glove box (below) so I can see if system pressure is adequate prior to starting the run. Pressure gauge and, lower left, compressor switch. From there the air tube goes to a solenoid valve. The valve, with no power applied, diverts air pressure to the piston, depressing the brake pedal. 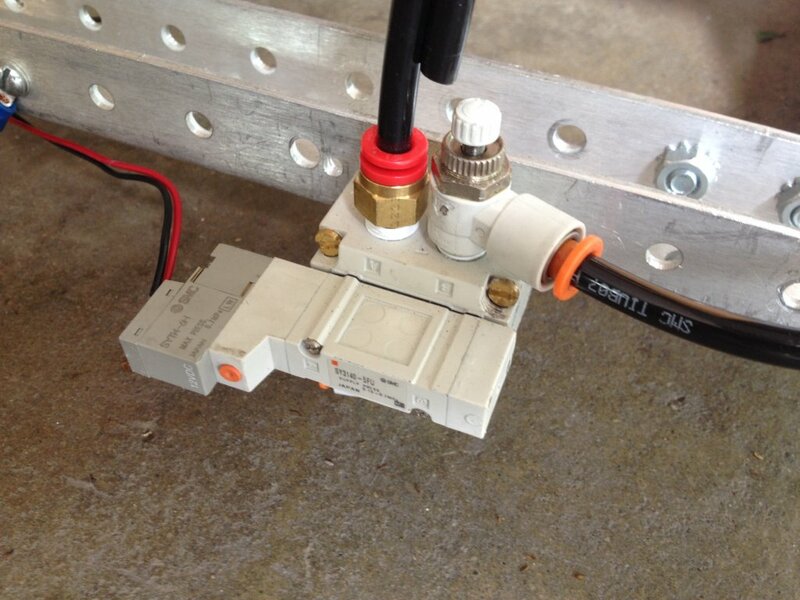 The MCU controls the solenoid valve through a Pololu relay board to divert air from the piston. A spring pulls the piston and actuator arm away from the brake pedal. We also installed an air flow control in the system so that the vehicle didn't slam on the brake too fast. It stops quickly but without giving us (much) whiplash. How Do We Move The Truck? So you might wonder: if the brake actuator is engaged by default, how do I move the vehicle around? Inside the cabin there are two manual valves that let me isolate and bleed pressure off of the actuator, respectively. By using a spring to pull the arm back, the system doesn't interfere with manual brake application when there's no air pressure applied. 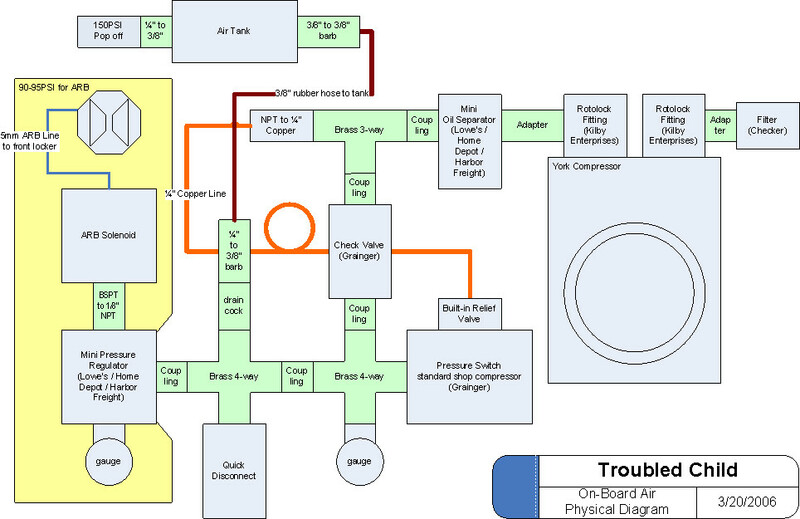 Our pre-flight checklist ensures that we have the compressor on, pressure in the system, and pressure applied to the actuator before we arm the vehicle for an autonomous run. The post-flight checklist includes steps to bleed pressure from the actuator piston so we can drive back to the pits. 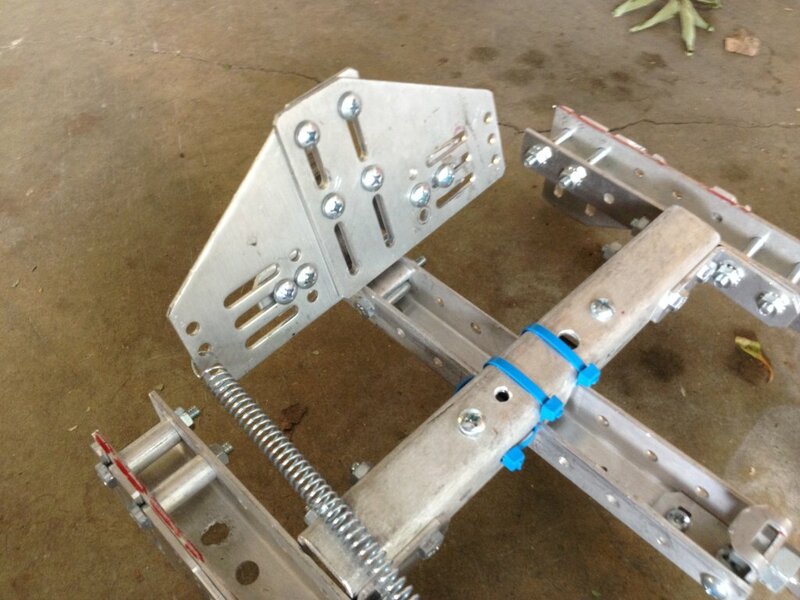 The Actuator frame is made from aluminum channel used and discarded by FIRST teams years ago, just like other parts in the pneumatic system. 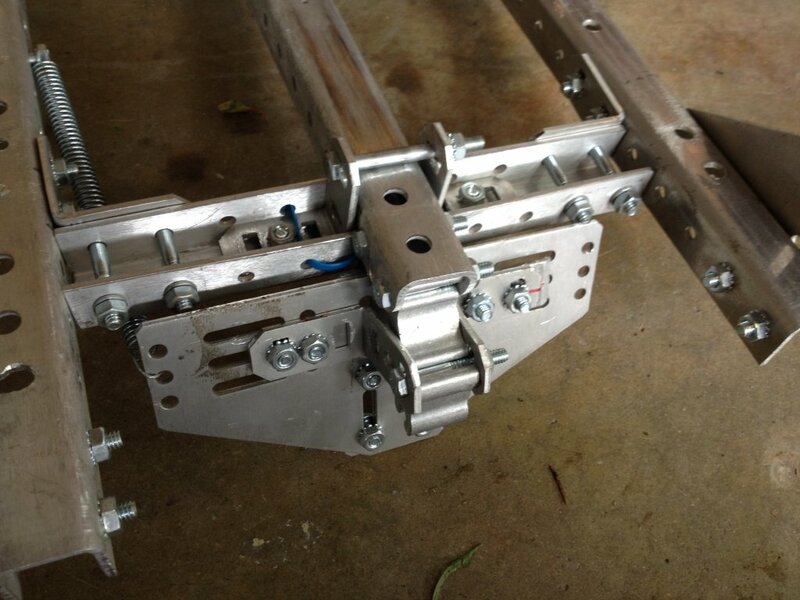 The frame bolts to the Jeep seat bracket and can be installed or removed in about five minutes. We cut a slot in the forward frame cross-member as a guide for the pedal arm. After much tuning and tweaking we installed zip ties as bushings to improve operation. 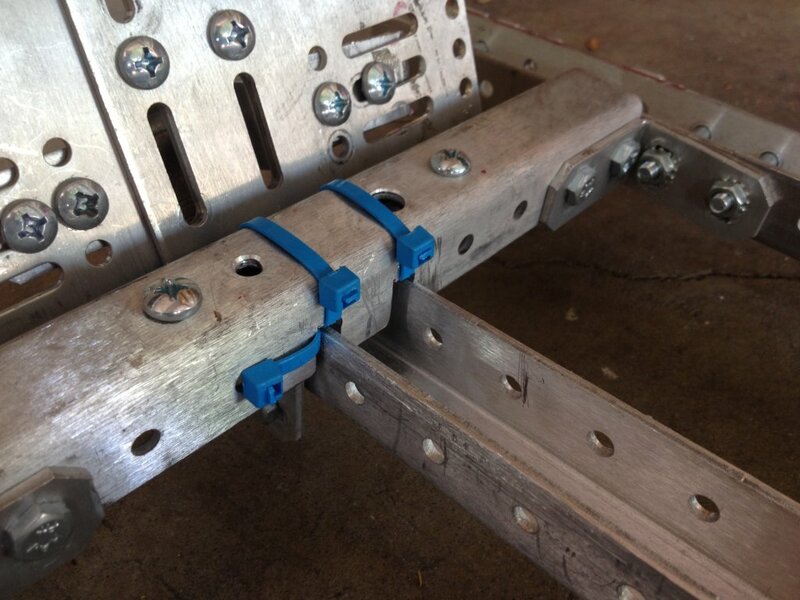 Originally we designed a bracket that would clamp to the brake pedal. The design interfered with manual operation as well as suffering from some geometry challenges. Our final design essentially implements a mechanical foot, a large flat surface that presses on the bottom part of the brake pedal and very effectively translates horizontal force to the brake pedal. Overall, it worked beautifully. 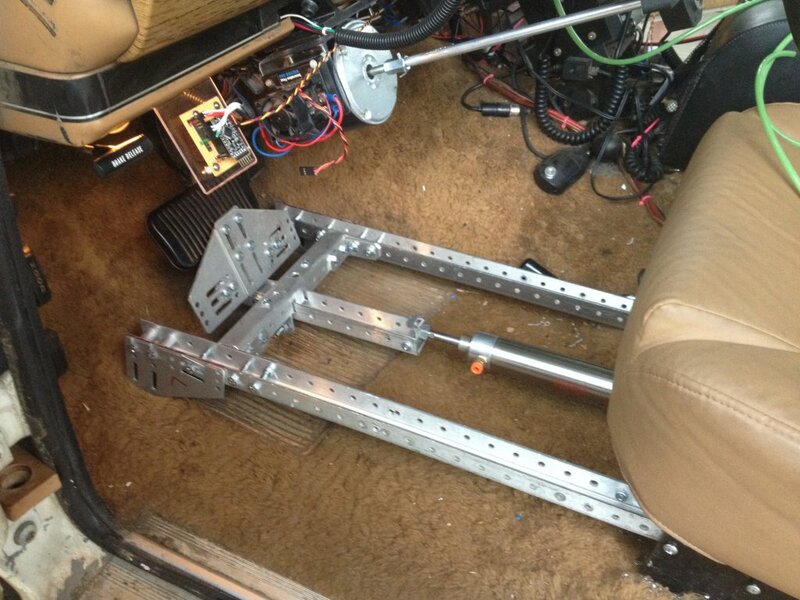 The actuator applies an enormous amount of pressure on the brake pedal even with system pressure set to only 60psi. When we had issues during testing early on Friday, the e-stop button deployed the brake quickly and effectively. The brake actuator held the vehicle in Drive, and released for the start of the run, no problem. It stopped the vehicle at the end of every run like clockwork. AVC: What About Data Bus?